Todolwen: More Pincushions For My Etsy Shop ..
today I am giving you a little preview of four more pincushions that I have chosen to place in my Etsy shop early tomorrow morning. They too are all early pieces of mine. 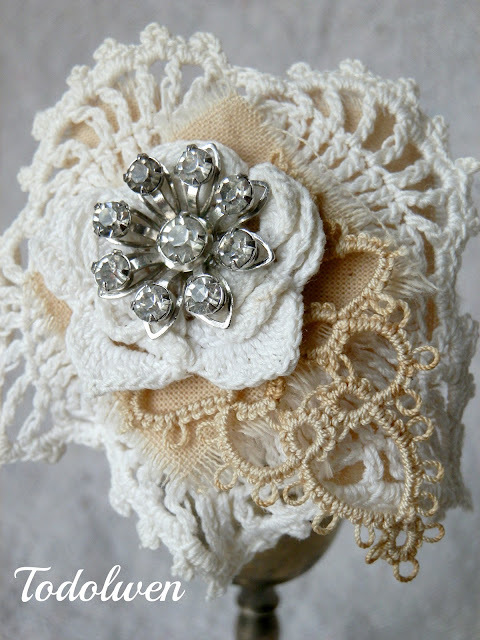 Again they are all made from bits and pieces of vintage fabric, lace, doilies and and a tarnished drinking vessel. They are all embellished differently from each other but each one very neat and pretty in it's own way. So ... here is a little preview .. I will be listing these four pincushions early tomorrow morning in my Etsy shop. If you wish ... why not stop by and take a look. You always make me very happy when you visit me here at Todolwen so do pop by sometime soon again. The pincushions are very beautiful! Sweet little treasures. I love them all! Adore your pincushions. You make me want to rush home from work and create! I love when that happens. Such pretty work you always do! So pretty. I really like the way you layer them with all the different fabric and textures. Love the bling! !